For a few years in the early fifties when I lived and went to school in Carrick-on-Suir, my father, John Wall, frequently reminded me that I was descended from the Walls of Coolnamuck. At the time, the significance of this information meant very little. I was probably too young and had no real interest in Irish or family history. Many years later, in August,1971, to be precise, my father bought a copy of Hubert Gallwey’s The Wall Family in Ireland 1170-1970 and that book plus the author’s handwritten receipt, signed and dated, for four pounds and ten shillings is still in my possession. When I and other members of the family read the book, particularly the four chapters devoted to the Walls of Coolnamuck, we then began to realise that being descended from this illustrious family was indeed of real significance and something to be proud of. The Walls, their very substantial Coolnamuck estate, their close relationship with the great Ormonde family, especially with James, Duke of Ormond, are an integral part of the proud history of Carrick-on-Suir and I am pleased to have some small connection with that history. It should never be forgotten that Garrett Wall of Coolnamuck was one of the first of the Confederate officers to be killed while defending Drogheda against Cromwell and is mentioned in despatches of that time. His brother Edmond who was a colonel serving in the French Army was killed in battle at Rethel in 1650. Another brother, Michael, a lieutenant-general, also fought for France and was killed in the great battle between French and Spanish at Rocroy in1643. Yet another member of this illustrious family, Walter, a lieutenant-colonel,played a major part in the defence of Clonmel against Cromwell in 1650. My appreciation of Hubert Gallwey’s book is, of course, in many ways connected with my strong links to Carrick as both my Wall grandfather, James ( Jimmy ), and great grandfather, John, were from the town. In fact, those Carrick links are even stronger as my maternal grandfather, Thomas O’Keeffe, was also a Carrick man. My mother, originally Jennie O’Keeffe, and all her family were also from Carrick. All of the above, I hope, explains, to some degree, why I felt so compelled to republish the Wall book and bring its Norman/Irish and Carrick social history to a wider audience. The author of the Wall book, Hubert Gallwey was a great scholar and, in a sense, very much before his time when one considers how popular the study of genealogy has become today. Most genealogy magazines and tv programmes on the subject refer to the present as” the golden age of genealogy”. Hubert Gallwey was quite an extraordinary Irishman who was a colonel in the British Army, served during WW11, was a graduate in history from Oxford and was editor of The Irish Genealogist magazine for 15 years. Hubert, from Faithlegg in Co. Waterford, devoted almost seven years of his life to compiling the Wall book and the amount of research work conducted by him was nothing short of phenomenal. Whether your name is Wall or not, if you have any interest in Norman/Irish history or genealogy in general, you will find this book an enjoyable and interesting read. If the book helps you to expand your family tree or make a link with a long forgotten relative or ancestor, then that is an added bonus. The revised ( but not updated ) second edition of the Wall book contains new photographs of Ormonde Castle, Kilcash Castle (origanally owned by the Walls) and the remains of the Wall Castle or tower house in Coolnamuck. I hope that these illustrations and the extensive Coolnamuck history outlined in the book will, in time, draw many of those who read the book and are now living abroad or are of Irish ancestry, back to Ireland and to Carrick in particular. 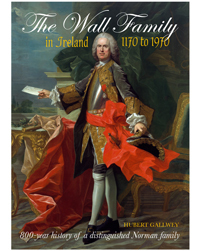 Apart from the references to Carrick-on-Suir in Co. Tipperary, the book also traces in some considerable detail the history of Wall families from at least seven other counties in Ireland. The Wall book has now been available from ASA Marketing in Cork and through our website www.thewallfamilyinireland.com since last October. 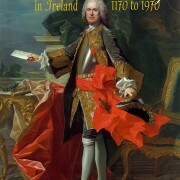 To date, Irish sales have been excellent and I would like to thank all those people who have bought the book already. Some orders were for multiple copies to be sent to Walls living abroad. As word spreads about the book’s availability, we are now receiving orders through the internet from the UK, USA, Australia and New Zealand. We know that there are in the region of 10,000 Walls listed in the UK. over 5,000 in Australia and a whopping 100,000 listed in the US. A big percentage of these Walls will, no doubt, be of Irish descent. So please tell your Wall relatives about the book or better still send them a copy for that special occasion. Greetings to all members of the Wall clan worldwide.